Browse faster! 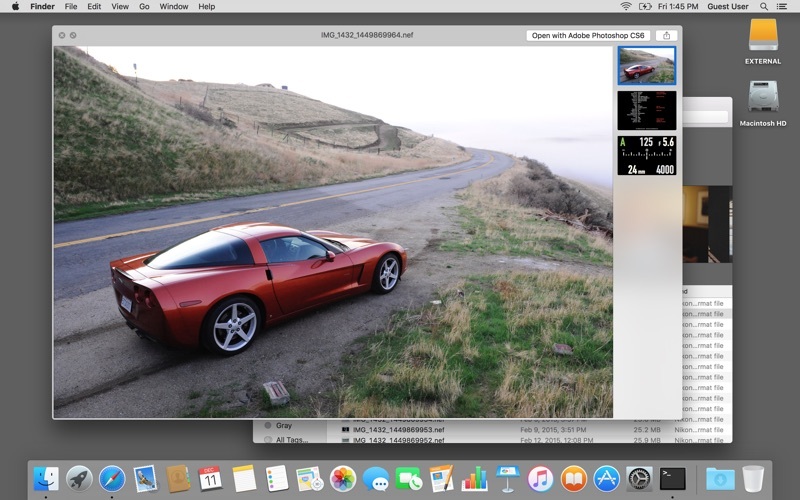 In Finder, select a Nikon Raw (.NEF), Canon Raw 2 (.CR2), Sony Raw (.ARW) or JPEG file and press spacebar to display the image- the system will invoke Raw Right Away to generate an enhanced preview that includes photo metadata and a graphical summary of exposure settings. Best of all: it’s very fast, so you are no longer made to wait while browsing raw files. Metadata includes shutter count for many Nikon and Sony cameras. 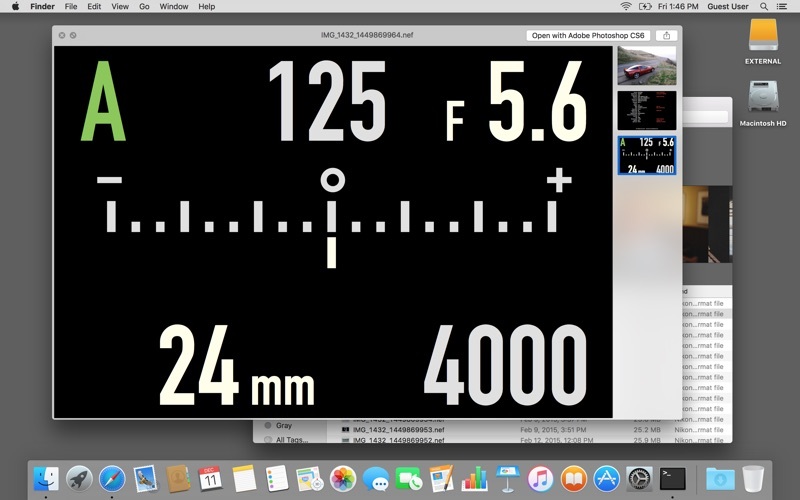 Shutter count is not available for Canon. You can customize the appearance of previews and thumbnails (icons) in Finder with embedded captions that include timestamp, frame number, or file name. 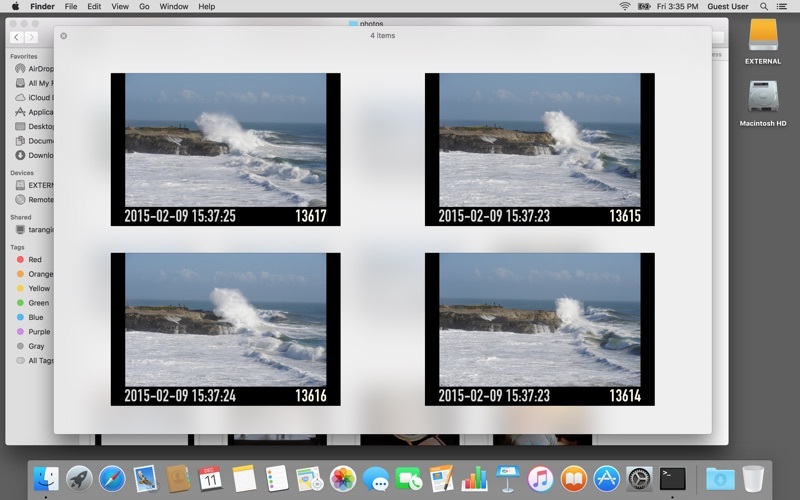 • Apply Camera Timestamp: restores file timestamp to the time of image capture. • Apply World Timestamp: same as Apply Camera Timestamp, but adjusts for time zone. • Copy Metadata: copies metadata to pasteboard so it can be pasted into an e-mail message, text document, etc. 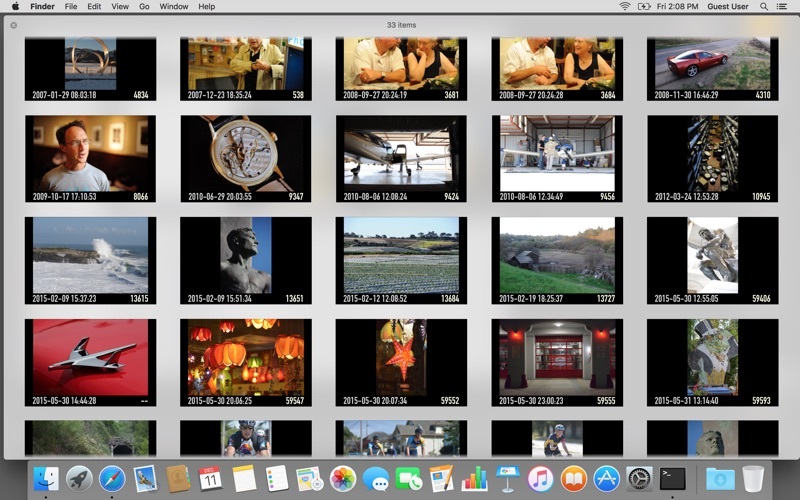 • Export Metadata to Tags: creates Mac OS file tags from the image’s embedded metadata. Makes it easier to search metadata from the Finder search box. • Clear Exported Tags: clears Raw Right Away tags. Leaves other tags alone. Nikon: D1x, D2h, D2x, D2xs, D3, D3s, D3x, D4, D4s, D5, Df, D40, D50, D60, D70, D70s, D80, D90, D100, D200, D300, D300s, D500, D600, D610, D700, D750, D800, D800e, D810, D810a, D850, D3000, D3100, D3200, D3300, D3400, D5000, D5100, D5200, D5300, D5500, D5600, D7000, D7100, D7200, D7500, Nikon 1 AW1, Nikon 1 J1, Nikon 1 J2, Nikon 1 J3, Nikon 1 J4, Nikon 1 J5, Nikon 1 S1, Nikon 1 S2, Nikon 1 V1, Nikon 1 V2 and Nikon 1 V3. Canon: EOS-1D Mark II, EOS-1D Mark II N, EOS-1D Mark III, EOS-1D Mark IV, EOS-1D X, EOS-1D X Mark II, EOS-1Ds Mark II, EOS-1Ds Mark III, EOS 5D, EOS 5D Mark II, EOS 5D Mark III, EOS 5D Mark IV, EOS 5DS, EOS 5DS R, EOS 6D, EOS 6D Mark II, EOS 7D, EOS 7D Mark II, EOS 20D, EOS 30D, EOS 40D, EOS 50D, EOS 60D, EOS 70D, EOS 77D, EOS 80D, EOS 100D/Rebel SL1, EOS 200D/Rebel SL2, EOS 350D, EOS 400D, EOS 450D, EOS 500D/Rebel T1i, EOS 550D/Rebel T2i, EOS 600D/Rebel T3i, EOS 650D/Rebel T4i, EOS 700D/Rebel T5i, EOS 760D/Rebel T6s, EOS 800D/Rebel T7i, EOS 1000D/Rebel XS, EOS 1100D/Rebel T3, EOS 1200D/Rebel T5, EOS 1300D/Rebel T6, EOS M, EOS M3, EOS M5, EOS M6, EOS M100, PowerShot G1 X/G7 X/G7 X Mark II/G9/G9 X/G9X Mark II/G10/G11/G12/G15/G16, PowerShot S90/S95/S100/S110/S120, PowerShot SX1 IS and PowerShot SX50 HS. Sony: DSC-RX1, DSC-RX1R, DSC-RX1RM2, DSC-RX10, DSC-RX10M2, DSC-RX10M3, DSC-RX100, DSC-RX100M2, DSC-RX100M3, DSC-RX100M4, DSC-RX100M5, DSLR-A230, DSLR-A290, DSLR-A330, DSLR-A350, DSLR-A380, DSLR-A450, DSLR-A500, DSLR-A550, DSLR-A560, DSLR-A580, DSLR-A850, DSLR-A900, ILCA-77M2, ILCA-99M2, ILCE-3000, ILCE-5000, ILCE-5100, ILCE-6000, ILCE-6300, ILCE-6500, ILCE-7, ILCE-7M2, ILCE-7R, ILCE-7RM2, ILCE-7S, ILCE-7SM2, ILCE-9, ILCE-QX1, NEX-3N, NEX-5, NEX-5N, NEX-5R, NEX-5T, NEX-6, NEX-7, NEX-C3, NEX-F3, SLT-A33, SLT-A35, SLT-A37, SLT-A55V, SLT-A57, SLT-A58, SLT-A65V, SLT-A77V, and SLT-A99V. 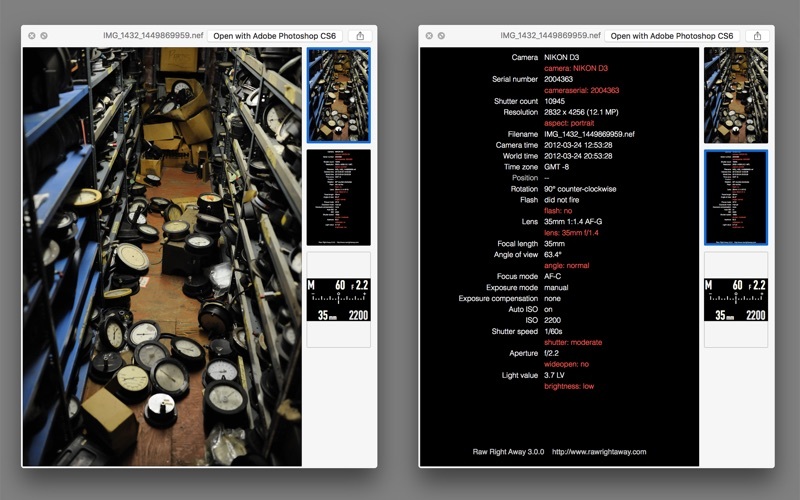 JPEG previews: Raw Right Away supports valid JPEG files produced by all cameras, including Nikon, Canon and Sony models not listed above, as well as all other manufacturers. (JPEG previews require MacOS X 10.10 or later). General Notes: Not all metadata is available for all cameras. For more information, including the shutter count availability by model, visit the Raw Right Away website. The image caption text size is now adjustable. Improved compatibility with some camera models’ metadata. Fixed issue where some Nikon D100 files would not appear.